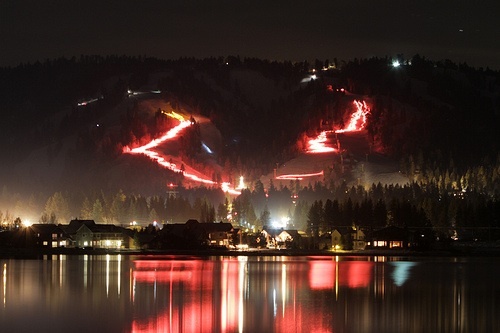 Ringing in the new will be an enlightening experience at Snow Summit, where the annual New Year’s Eve Torchlight Parade begins at 7 p.m. The parade is free and open to all ages for viewing. It begins when more than 200 employees descend the mountain on skis and snowboards, each caring a torchlight. This amazing display illuminates the night sky and gives the mountain an astounding glow. After the parade, onlookers are encouraged to join Big Bear Mountain Resorts to help ring in the new year. Guests will have two parties to choose from, one at Snow Summit and one at Bear Mountain. At Snow Summit, guests can enjoy live music from DJ Slip Matt from 6 to 8:30 p.m. at the Slopeside Pub and can dance the night away with DJ Desi at the Bullwheel Bar. At Bear Mountain, partygoers can ring in the new year at The Scene Bar with live music by Club George. Both parties begin at 9 p.m. and end at 1 a.m., and will have specialty drinks, hors d’oeuvres, and a New Year’s Eve countdown. The New Year’s Eve parties at Snow Summit and Bear Mountain are 21 and older only. Tickets are $25 for each party, and can be purchased at the door. This entry was posted in Bear Mountain, Snow Summit by Jerry Rice. Bookmark the permalink.